Composed by Rob Romeyn. Young Concert Band. Sound Foundations Series. Audio recording available separately (item CL.WFR380). Score and set of parts. Composed 2013. Duration 1 minute, 53 seconds. Published by C.L. Barnhouse (CL.023-4234-00). 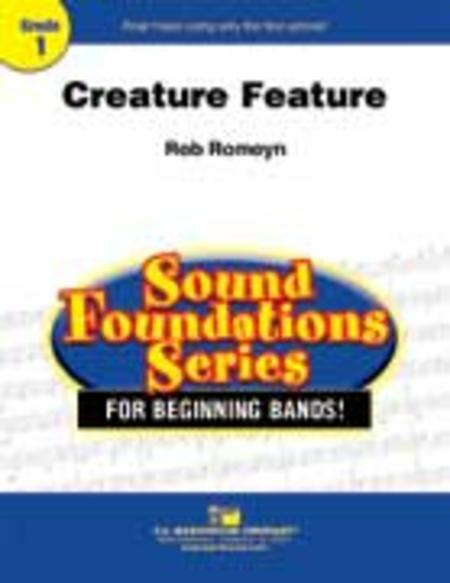 An absolute beginning band showstopper, "Creature Feature" will be the hit of any concert program! Each section of the band has the opportunity to play memorable melodic themes and be inspired to create dynamic contrast. This fun, spooky and catchy novelty tune is designed to be performed in the second semester of study. You will want to save this for the end of rehearsal - your students will want to play this one over and over!! Scary sounds and frightful fun!